Hawa, Mabelle. 2006, photography by Deb Barndt. 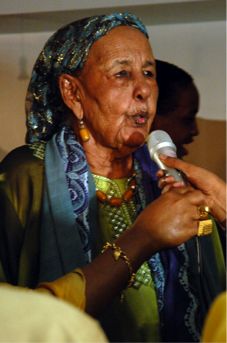 Hawa Jibril (1920-2011) composed and recited her first poem when she was a 12-year-old nomadic girl, spurred on by a family squabble. 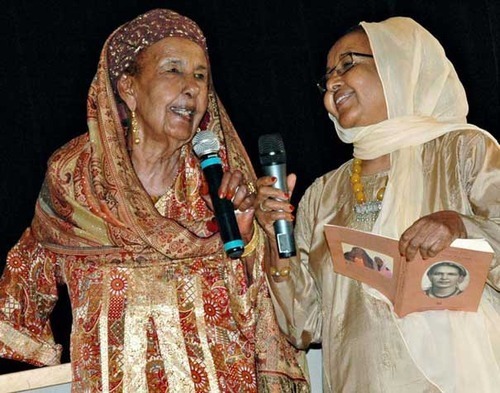 For almost 80 years, through her poetry, she challenged women’s oppression, colonialism, clan warfare, and the plight of refugees, using Somali oral alliterative genres, which are at once social commentary, collective memory, and instruments of social change. Somalia didn’t have its own standarized written language until 1972 when the Somali latin alphabet was used as the official writing script. Until very recently Hawa’s poems were carried only in her mind, and in the minds of her family and compatriots. Now her poetry has been compiled, transcribed and translated into English by her daughter, Faduma Ahmed Alim, who also wrote a biographical introduction, and published in both English and Somali by Jumblies Theatre, a Canadian organization that creates art with, for and about communities. From the nomadic plains of Somalia, to the city of Mogadishu, to international conferences, and her adopted home in Toronto, Hawa Jibril inspired others to stand up for human rights and social justice. Though she was not generally known to other Canadians, for most Somalis Hawa Jibril is a household name - and the largest Somali diaspora community in the world is in Toronto. The title of the book – And Then She Said, Saa Waxay Tiri – comes from a Somali ritual phrase that is used to introduce a poet (usually male). Hawa’s poetry draws the reader into a tales, crossing time and space – from camel herding to gun battles, from desert shrubs to city streets, from the boldness of youth to the sorrow and wisdom of age, from Mogadishu’s turmoil to a Toronto high-rise – as one woman’s life and poems speak for thousands of others who, like Hawa Jibril, have braved perilous bridges, adapted and changed, and ended up living, with often un-noticed talents and distinctions, in our own Canadian cities. Jumblies Theatre was pivotal in ensuring that this important and beautiful body of work would be available in print. In 2007, Jumblies presented a play based on Hawa’s life and poetry, Bridge of One Hair, at the New World Stage. Hawa and daughter Faduma, 2008, Book Launch (Assembly Hall, Etobicoke), photography by Katherine Fleitas. The whole family ate from the same big bowl, but the men and boys’ side were served with the best pieces of meat. Hawa’s father, who was very fond of her, said she could take a piece from the male side. Her brother held onto the bowl, and wouldn’t share with her. They had a big fight, and she composed this poem and recited it to her family shortly after. So why he is threatening me since he had his share? Bal muxuu iigu goodinahayaa, gurey docdiisiiye.